A substitute of physical gold, Sovereign Gold bonds are government issues securities, which carry denominations in grams of gold. When you invest in Sovereign Gold Bonds, you not only eliminate the risks and costs associated with owning physical gold but also the making charges and concerns of purity. Apart from the fact that Sovereign Gold Bond is the safest way to invest in gold, it guarantees you an assured interest of 2.5% per annum. Starting from October 9, 2017, applications for SGBs will be accepted every Monday to Wednesday till December 27, 2017. 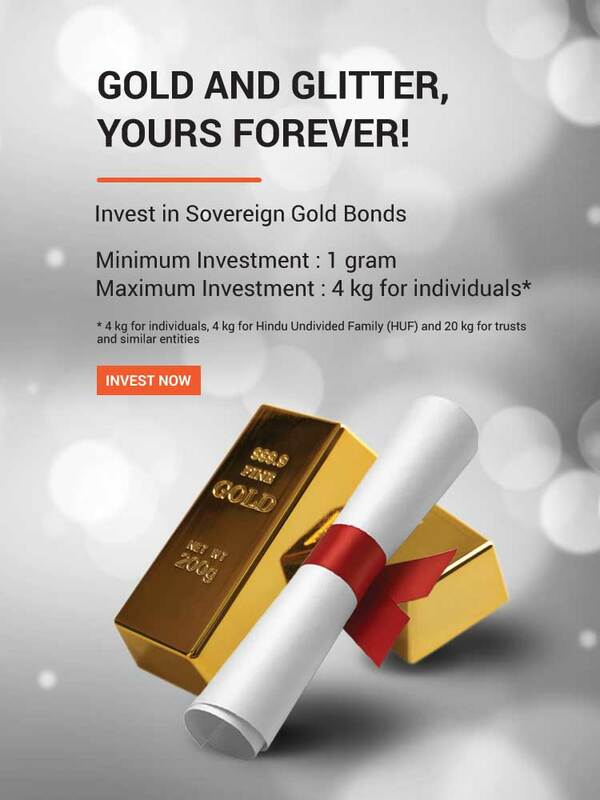 Why should you invest in Sovereign Gold Bonds? There is no TDS applicable on interest earned. You can avail Indexation benefit if bond is transferred before maturity. How do Sovereign Gold Bonds compare to Physical Gold, and Gold ETF? The investor will be advised one month before maturity regarding the ensuing maturity of the bond. On the date of maturity, the maturity proceeds will be credited to the bank account as per the details on record. In case there are changes in any details, such as, account number, email ids, then the investor must intimate the bank/SHCIL/PO promptly. Yes. The bonds can be held in demat account. A specific request for the same must be made in the application form itself. Till the process of dematerialization is completed, the bonds will be held in RBI’s books. The facility for conversion to demat will also be available subsequent to allotment of the bond. Client should read the Risk Disclosure Document issued by SEBI & relevant exchanges, the Do’s & Don’ts and the T & C on www.sharekhan.com before investing. Investments in equity is subject to market risks. You are advised to carefully read the red herring prospectus of the company and go through all the Risk Factors mentioned in the offer document issued by the company before investing. The investment as mentioned in the document may not be suitable for all investors. Investors may take their own decisions based on their specific investment objectives and financial position and using such independent advisors, as they believe necessary. Either SHAREKHAN or its affiliates or its directors or employees / representatives / clients or their relatives may have position(s), make market, act as principal or engage in transactions of purchase or sell of securities, from time to time or may be materially interested in any of the securities or related securities referred to in this report and they may have used the information set forth herein before publication. This mailer is the purpose of information only. Invest only only after referring to the Red Herring Prospectus dated 6th September 2017.